Side note: Mercury has gone direct! I can finally start blogging again. Phew! 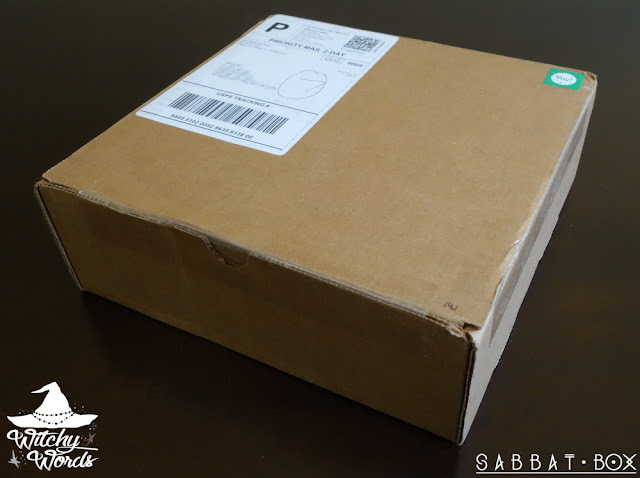 In April, I was honored to be able to review for my readers the first ever released Sabbat Box. For those that don't know, Sabbat Box is a subscription service that offers a box of sabbat-related items every 45 days - just before each sabbat. It's kind of like the Loot Crate for pagans, Wiccans and Witches, and supports small, pagan-owned businesses in the process! 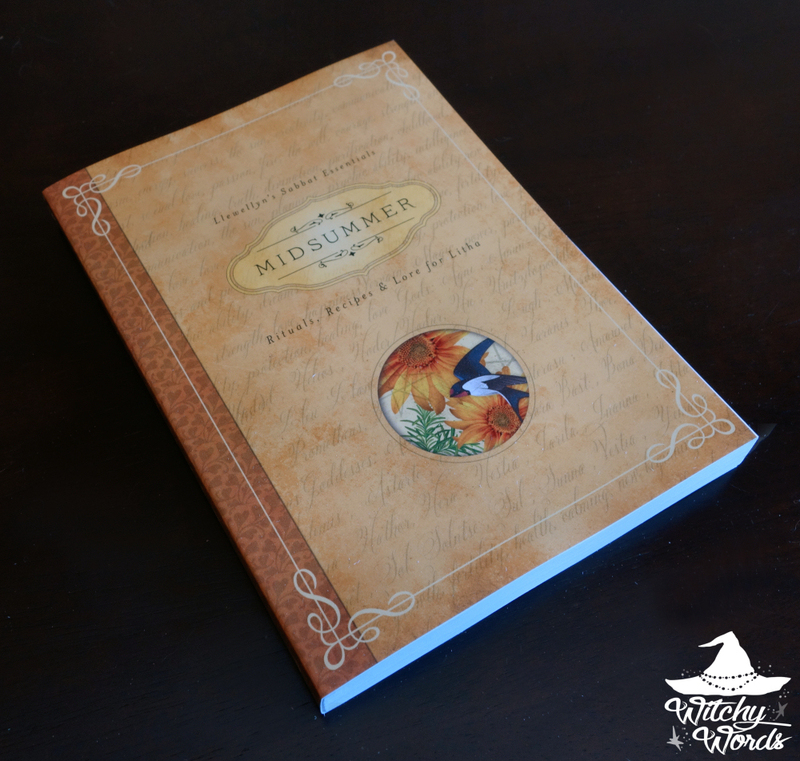 On Wednesday, I received the Midsummer Magick box and I'd love to share with my readers just what I found inside! 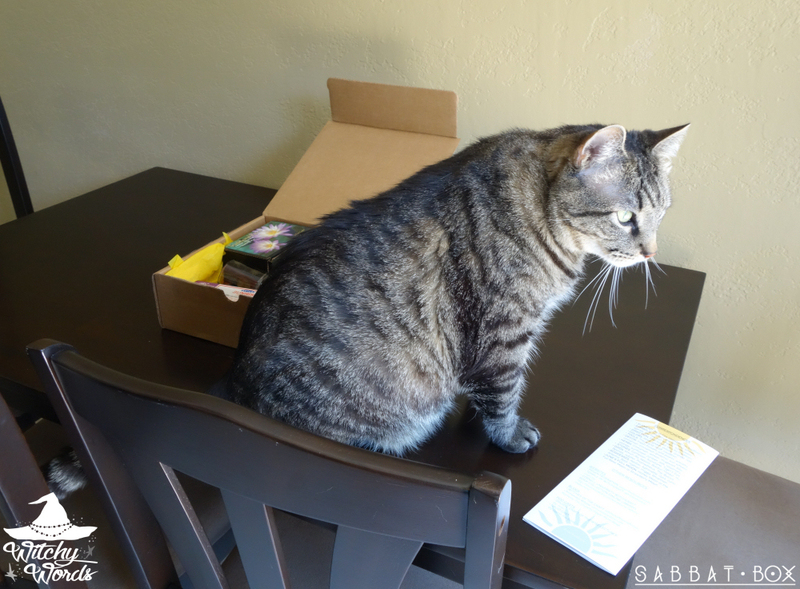 Of course, Sabbat Box is always a manageable size. It would fit into my mailbox if the delivery guy ever decided to actually drop it there. However, I can't tell you how excited I get when I find it out on my porch in the morning! 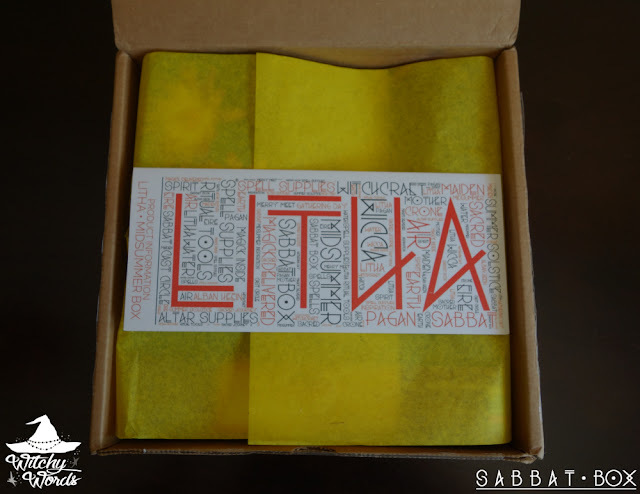 As usual, Sabbat Box boasts an amazing aroma provided by the incense it carries, and begins with s small paper that describes the contents of the box. I was thrilled to see that they opted for a three-panel pamphlet this month rather than the large card from Beltane. It allows for significantly more information to be provided to the subscriber. Much of this information can be found now on the Sabbat Box blog (click here). 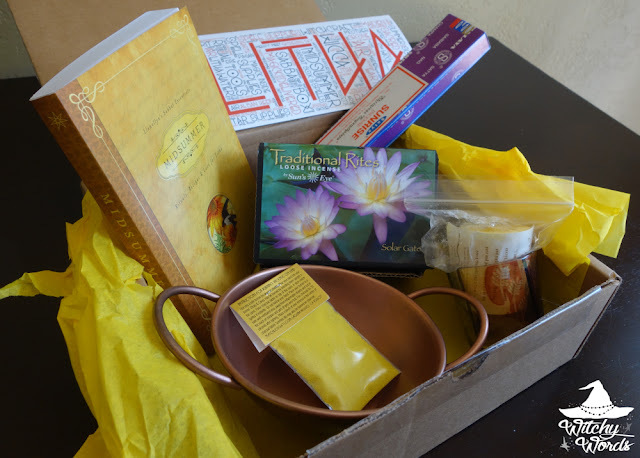 And here's the Midsummer Magick box as presented once you break the seal on the yellow tissue paper! The first thing I noticed is an abundance of incense in this box. This is highly appropriate as Midsummer is a very yellow, light, airy, masculine holiday, all words I would use to describe the east. 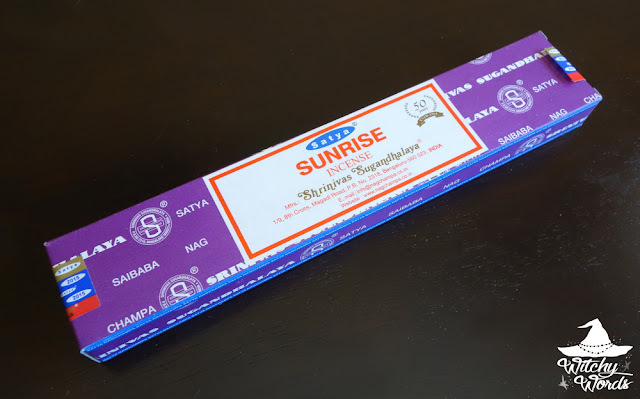 Satya's hand-rolled stick incense could come in handy for opening or blessing a Midsummer circle or charging your tools as you can use the stick to direct your energy. You could also simply use Sunrise for its beautiful floral and Nag Champa blended scent. We're already a few sticks down in our household and were pleasantly surprised by the purity of the aroma. The second set of incense provided is a loose Traditional Rites Solar Gate incense by Sun's Eye. This combination of frankincense, orange, bay, cinnamon, copal, cedar, angelica, sunflower, juniper berry, rowan berry and golden bough, when burned, produces a high quality scent that's perfect for Midsummer. Use this along with a small fan or even your hand to imbue the people within your circle with the herbs and create your sacred space. The box provided gives you a brief description of the incense along with charcoal brickettes, but that's not all you're going to need if you'd like to utilize this item. Fortunately, Sabbat Box has you covered! The first thing I noticed when I picked up the box from my porch was the sound of copper within. In fact, my roommate and fellow Circle of Fountains member Tony said that I'd never proved I was a witch more than when I corrected him from glass to specifically copper when he heard the sound as well. Turns out I was right. In order to burn loose incense with a charcoal brickette, you'll need a vessel of some sort. 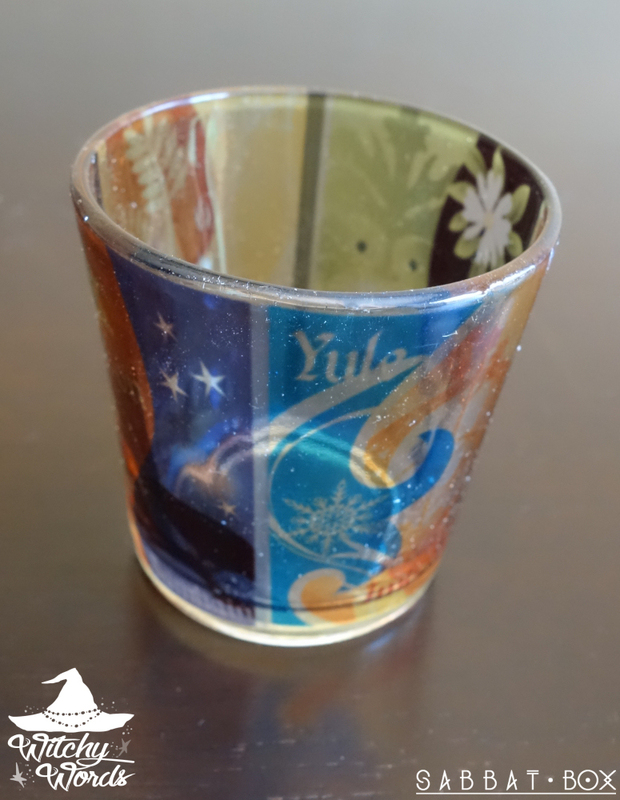 That's where this ritual offering and incense vessel by Azure Green comes in! This was one of my favorite pieces in the box. This little guy is going to get so much ritual and altar use! While the pamphlet includes some instructions for burning charcoal, I would heavily caution to protect your bowl and its surroundings as much as possible. Hot herbs can crack and pop, causing a fire hazard, so please place this bowl at least one foot away from anything flammable. Also, because the bowl is going to get extremely hot, I would consider placing it on stone or something that's not flammable and can displace the heat from the surface of your work space. You'll also need something to protect the inside of your bowl from heat damage. That's where this sand from Mystic Temple comes in. I would encourage you to start by covering the inside of your bowl with a layer of tin foil. 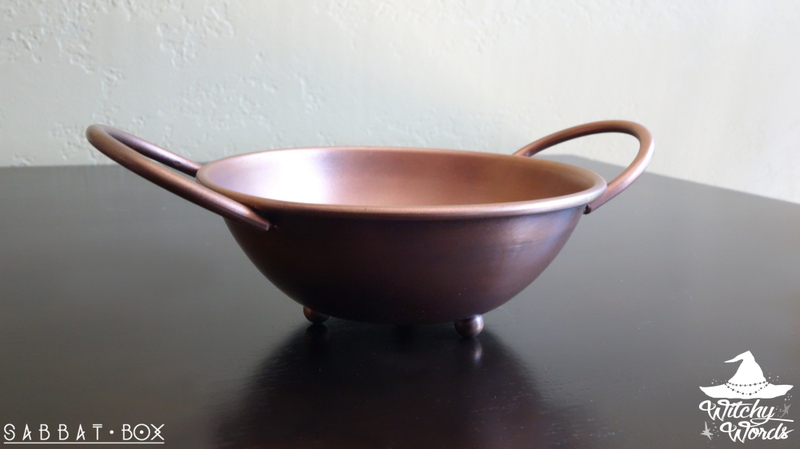 The incense bowl provided should take heat just fine, but the tin foil will protect it from any unintentional heat damage, keeping the inside copper beautiful and fresh. I would then use the sand to build a small hill, on top of which you'll place your charcoal brickette. The reason you'll want a small hill as opposed to a flat layer or a valley is that you'll want to give the edges of your brickette plenty of oxygen so it can burn evenly. Using a long kitchen match or a barbecue lighter, light your charcoal brickette and allow it to burn for a bit. You'll want to wait until a thin layer of white ash covers your charcoal before putting your incense onto the brickette. This will help temper the heat from the charcoal so your incense will burn longer as well as avoid the popping and cracking dangers of overheated loose incense. It doesn't mean it won't happen - safety first - it's just less likely to do so. If you'd like to further protect your incense, you could cover your charcoal with a thin layer of salt or sand, or even create a small tinfoil bowl with a flattened bottom to set on top of the brickette. This is of course once the charcoal has burned enough to produce a full layer of white ash. 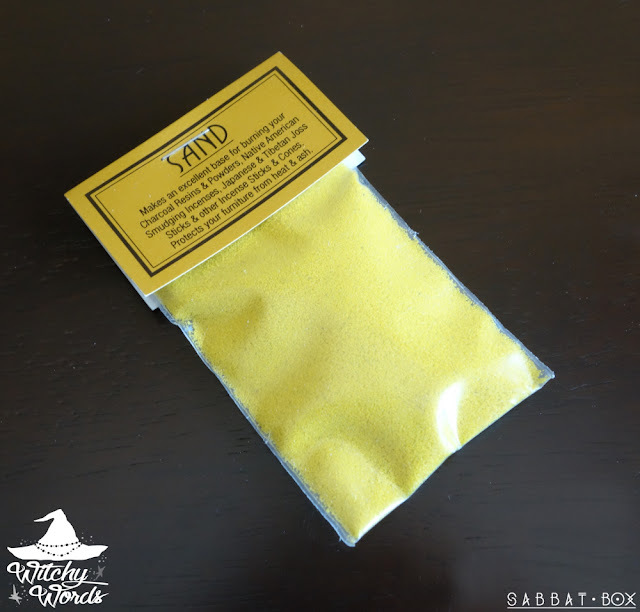 While the extra protection isn't necessary, it may help extend the life of your incense. Now's the perfect time to sprinkle a bit of loose incense onto the top of the brickette! Don't use too much - you don't want to smother your brickette. You'll be surprised that a little goes a long ways. Enjoy around an hour of aroma. Make sure your charcoal is completely extinguished before walking away from it. Once you're done, be sure to store your loose incense and your brickettes separately in air-tight bags. Any kind of moisture can significantly lessen the lifespan of your supplies. But enough about incense! 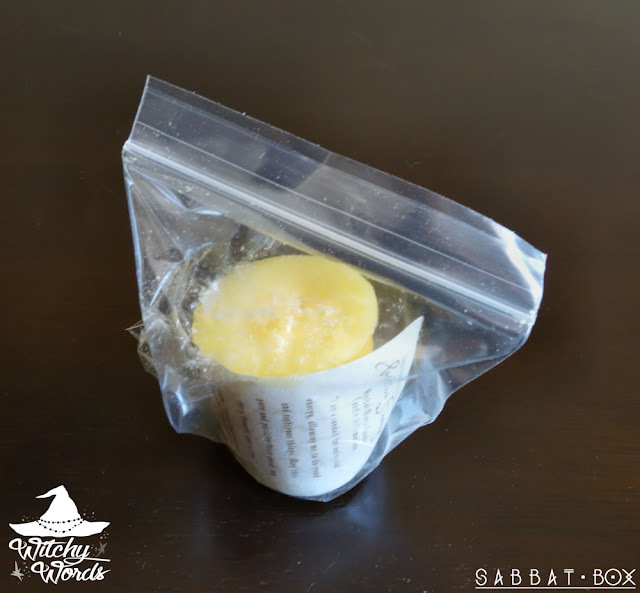 Onward to the other items you'll find in the Midsummer Magick edition of Sabbat Box! This votive candle is hand poured with a variety of essential oils by Crystal Journey Candle Company and is Reiki charged with positive energy for your sabbat! Use this item as a spell candle by carving into it or charging it of your own accord (remember- up/clockwise will bring to you and down/counter-clockwise will banish!). You could also use it as an altar candle! To help you, Sabbat Box has also provided you a Wheel of the Year votive candle holder for your Crystal Journey candle. Supplied by Eclectic Artisans, the sister company to Sabbat Box, this item could be used throughout the year on your altar as it has been decorated to represent all of the sabbats! Of course, no Sabbat Box is complete without Deborah Blake's new sabbat series provided by Llewellyn. As I mentioned last time, this book series is definitely more for beginners, though it could be a great refresher for those more experienced. Either way, I think it's particularly pertinent to Sabbat Box. 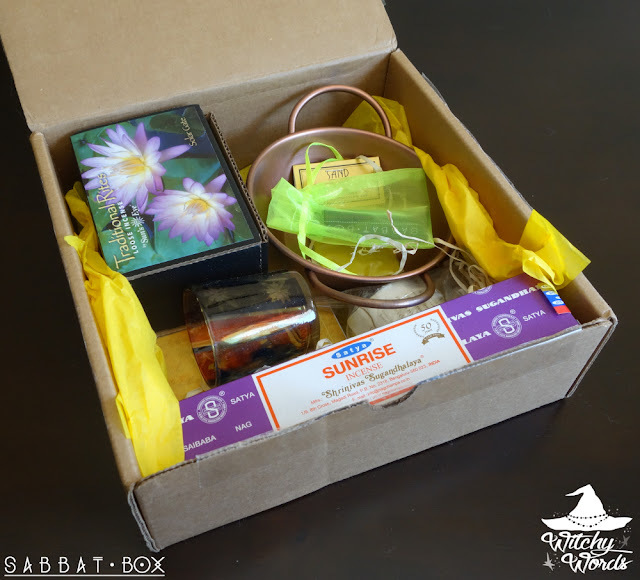 If you're not sure what to purchase for the sabbat or how to celebrate it, Sabbat Box is your one-stop-shop. Including this book ensures new pagans and witchlings have everything they need to have their own ritual for Litha. Plus, as a pagan bibliophile, I can't say that I'm not super excited to be collecting this series! 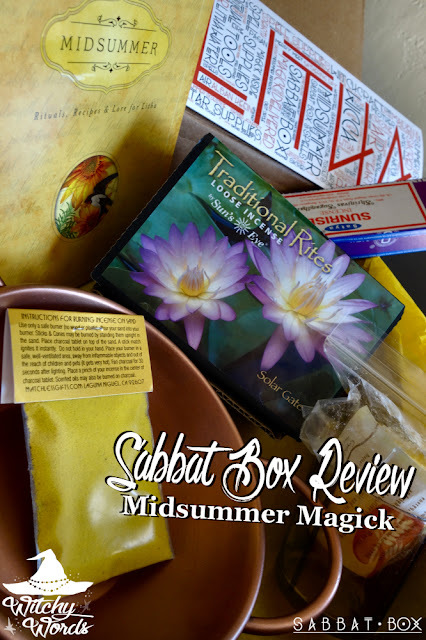 I thought Sabbat Box's Midsummer Magick box was particularly well put together. Not only were all of the items expressly Litha themed, but all of the relevant tools you might need to utilize each item were provided for you. If you've never worked with loose incense before, you have everything you need! 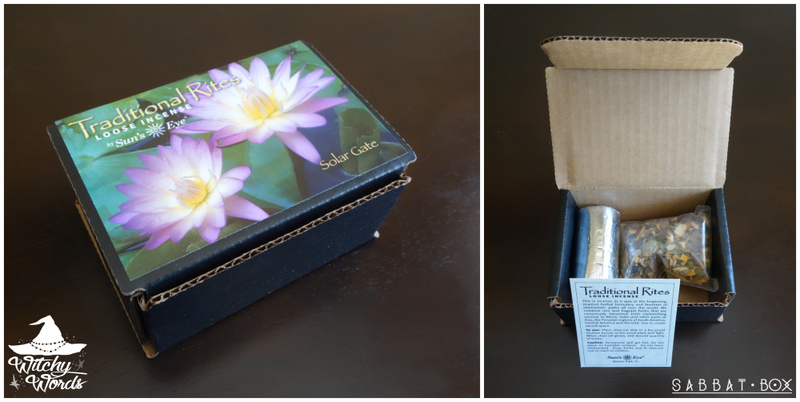 For a votive candle holder for your new candle, you need not look any further than the box itself. 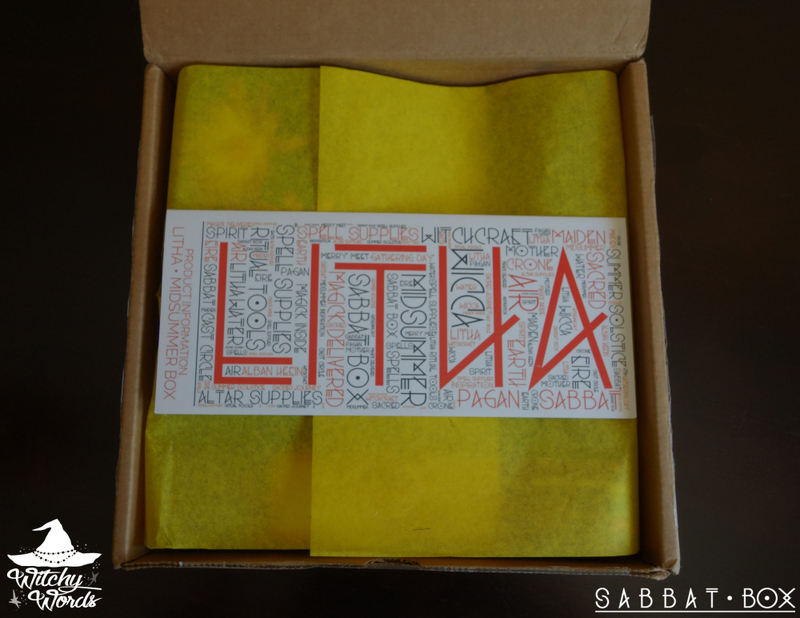 I was incredibly impressed with this box and am very excited to see what's next for Sabbat Box for Lughnasadh! I spent a lot of time splitting hairs on whether the cost would be worth the investment, but it truly seems to be. That being said, I completely understand the money situation. If you ever have some spare money to sign up for a subscription, let me know what you think! And thank you for reading!